In the end, the most dominant boys relay crew at Nike Indoor Nationals last weekend wasn’t on the track, as they would have been expected to have been. It was the final section of the 4x400, the last event of the meet, and the speedsters of Track Eastern Carolina (New Bern HS from NC) were not out there racing the best of the best, as they had been seeded to do, but rather they were milling around the awards stand. There was interest, of course, as they watched with measured patience to see if clear leader Bethel VA, with anchor Ja-Vell Bullard, would beat their time. But there was also a little stoicism, a little detachment, because when you’re a teenage boy you don’t want to act too interested. And there were smiles here and there at the irony of the situation. Track EC’s 4x400 quartet, you see, had already put up a time on the board. There was a big picture to consider, and the club had its eyes on winning – or placing as high as possible – in four relays: the 4x200, sprint medley, 4x800 and 4x400. The last two finals on Sunday were back-to-back, and as most of Track EC’s runners were doing both events, Coach Nick Sparks asked to be placed in an early section to give his runners reasonable rest between races. They had blazed a 3:22.12, winning by more than five seconds. Used to dictating things on the track, the athletes had no control over their destiny here. They had to watch and wait. Would their time hold up for the win? Coach Sparks and his kids could have sat in the stands, but Andrew and Anthony Hendrix, Banks Barnes and Rodney Stewart had just topped the medal stand after winning the 4x800 (7:58.18), and Fuquawn Greene had done the same for his 21.98 200 not long before. Soon there would be another medal stand to climb, so might as well hang around. Teenage boys are not by nature a patient lot. But this group has learned there is no need to rush things. There’s a process and a big picture at work. There are no seniors in a small program that has gotten to the point where it can vie for national titles in almost any relay involving 200s, 400s, and 800s. They will likely be even better next year. The biggest thing, however, is this: Being part of this program, with Coach Sparks and his family, and Coach Dave Simpson, has been a very good thing in their lives. No hurry to move on. It’s hard to talk about this year’s New Bern squad without at least touching on the backstory – and adding to and clarifying what people already have heard. 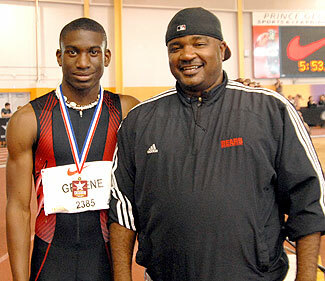 Coach Sparks and New Bern received national media attention when after Hurricane Katrina in 2005, he helped national class 800/400 runner Karjuan Williams and his family relocate from the New Orleans are to New Bern. 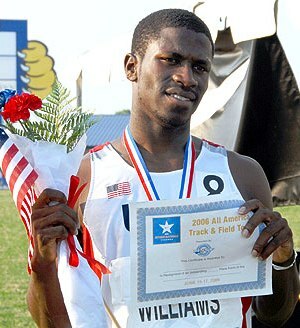 Sparks had met Williams at meets the previous year and when he heard of the athlete’s plight in the fall, he and his wife, Cathy, saw something they could do. The quartet qualified for the national JO meet and the “coaching bug” got a firm hold on Sparks. At the time, he says, New Bern was without much of a tradition, strength, or participation in the track program, despite being a 4A school. Football, he says, is the strongest sport there, and many athletes are encouraged to do specific off-season training that precludes track participation. Other athletes are in basketball and either just make it for the latter part of outdoor or aren’t in the sport at all. 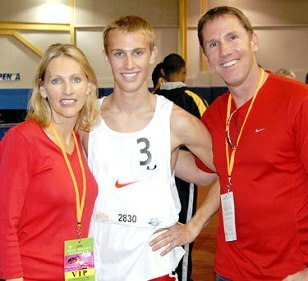 Sparks decided to donate an all-weather track to the school, and continued working with Miles and the Hendrixes. “They ended up training beside the New Bern HS team that Dave was coaching,” he said. “They ran again that summer. Anthony and Andrew had improved to 2:00 and 51, but unfortunately, Miles broke his arm and couldn't compete. 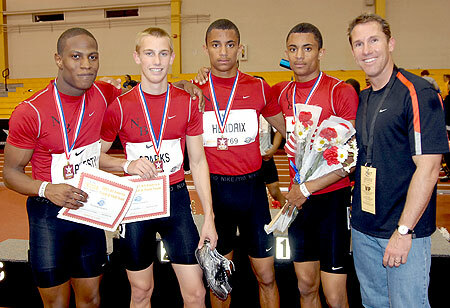 With the senior Williams, the young Hendrixes, now-graduated standouts Kelvin Hardesty and Darryl Reynolds – and with the guiding energy and expertise of Sparks and Simpson – New Bern quickly developed into a state power, tying for the indoor championship and winning the outdoor in 2006. Williams won both NIN and NON in the 800, and Track EC's SMR did as well, running 3:22.47 in Greensboro – just 1.37 off the USR and #4 all-time. But then Williams was gone and what remained was a young team with years ahead of them to continue to progress. As that process has unfolded, so has the other part of what has become the Sparks family’s mission in the area: Trying to do what they can to improve the lives of the youth they come in contact with. “New Bern HS is located in a small, rural southern town, with all the problems that traditionally plague educational centers in those areas,” said Sparks. “The dropout rate is 27-40 percent (depending on who you ask and the year in question). For a big chunk of the students there, there is a lackadaisical view of education and a high rate of poverty. The city of New Bern also has problems associated with urban areas -- random violence, domestic violence, drugs, gangs and prostitution. New Bern High has all those problems, too. Thanks to the Sparks family and Simpson (who is also a volunteer coach and doesn’t work at the school), the program has developed far beyond what it probably would have, with a good facility and the means to travel. There has been a backlash of sorts, as the New Bern community and those in the North Carolina track scene have had various reactions to the quick ascension. They’ve raised questions, to which Sparks and Simpson have answers, but that kind of thing dies down slowly. “Coach Sparks tells us to ignore it, and just keep doing what we’re doing,” says Andrew. All of which brings us back to 2008. With most of his best athletes now juniors, Sparks and New Bern embarked on an ambitious schedule. While the coach says it was no more exotic than previous seasons, it seems like the school/club was everywhere – New York, Arkansas (they were scheduled for Virginia Tech, but opted for an in-state meet). 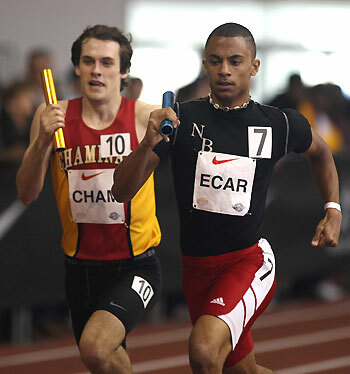 Track EC arrived in Landover with Blazin Raideresque hopes – four relay golds and an individual title. Waldorf TC had already run 1:28.85 (as Westlake MD) on this track, a time that was once the US leader. They peeled away from the field and blasted to a 1:28.90. New Bern had already reportedly hit 1:26.6 outdoors, but the quartet of Greene, Daishawn Styron, Mike Price, and Anthony Hendrix was good for 1:30.02 Saturday on this surface, and just barely managed the silver ahead of Nansemond River. Track EC’s signature event, the sprint medley, was next. But that wasn’t necessarily any easier as Cleveland Heights was in the field with anchor Jared Hall, the nation’s fastest indoor half-miler. Andrew Hendrix put on a big burst in his 2nd lap of the 400 leg to take the lead. Then on the anchor, Anthony Hendrix didn’t quite have Hall’s open credentials, but he has quietly developed the art of front-running, feeling out the opponent behind him, and knowing exactly when to apply the pressure. He turned it on right when Hall wanted to pass him and the Heights standout finally broke on the final straight. It wasn’t a record, but chalk one up for the quartet of Greene, the Hendrixes, and Miles Sparks, 3:29.24-3:31.14. Track EC has now won three straight SMRs in Maryland. 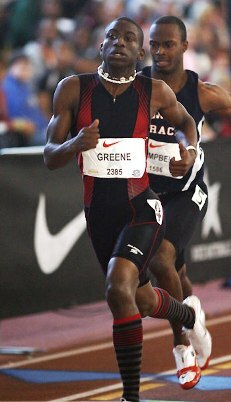 Meanwhile, Greene was asserting himself individually Saturday afternoon, qualifying first for the 200 final in 22.04. In Sunday’s final, he would just hold off Dominic Smith CT, 21.98-21.99. Then Track EC’s Banks Barnes, Rodney Stewart, and the Hendrixes, took to the track for the 4x800. Somehow, despite the sub-7:50 talents in the field, three legs passed with the leaders about 6:00. Favorites Track EC and Chaminade were trailing, but moved ahead by the final 400. Again, Anthony H. held off his foe and the North Carolinians had two in the hand. So it came down to the waiting by the podium as Bullard and Bethel chased the title. The versatile Virginia sprint power and its anchor have been on missions of their own this year, and winning the 4x400 was one of them. Bullard stopped the clock at 3:20.79, more than a second faster than he needed. Coach Sparks and his crew had put on one of the best relay shows by a boys club/school in meet history – two golds and two silvers, plus the gold by Greene. It was fitting – and perhaps inevitable – that as the Track EC standouts were hanging out at the stand with the winning Blazin Raiders’ girls 4x4 crew (also waiting to be decorated), that someone would come up with the idea to photograph them together. Why not? It’s easy to see the comparisons between the two programs, both rich with 200-800 range long sprinters. Time will tell if New Bern’s program develops the tradition of Eleanor Roosevelt’s. For now, it’s rich with the energy of a novelist that found a way to keep his love for track alive and provide spiritually-inspired service at the same time.